A bill due to be introduced in the U.S. Senate that would restrict ownership of so-called big cats is under fire by a prominent feline conservation group. 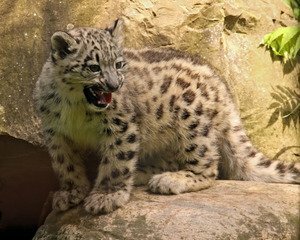 The snow leopard is one of the big cats that would be regulated by HR 4122. If it becomes law, HR 4122 would make it illegal to own, possess, or breed a big cat such as a cheetah, jaguar, leopard, lion, puma, snow leopard, or tiger; accredited American Zoo Association (AZA) members and facilities would be exempt. The Big Cats and Public Safety Protection Act of 2012 was proposed in the House of Representatives late last month by California Representatives Loretta Sanchez (D) and Buck McKeon (R); Sen. John Kerry (D-MA) has promised to bring the legislation to the Senate. Sanchez cited a recent incident at Zanesville Ohio, where police were forced to shoot 38 big cats that were set free from a wild animal farm before its owner committed suicide. Penalties for violating the proposed law would include fines up to $20,000 per animal and up to 5 years in jail. Yet the proposed legislation has met with resistance. The Feline Conversation Federation (FCF), for instance, claims HR 1422 will harm conversation efforts and lead to the banning of big cats from circus and stage events, movies and television, and eventually zoos. Lynn Culver of the FDF claims that there are already several laws in effect that protecting big cats. “Great cats are already well protected by federal laws,” she said. “You face far more danger driving to the zoo.” Culver also noted that a 2007 headline-grabbing incident at the San Francisco Zoo, where a tiger mauled several patrons, occurred at an AZA-accredited facility, and is the only public attack by an escaped tiger. Cluver also claims that the AZA does not preserve particular species, such as the African and Asian spotted leopards and black panthers, and is phasing out generic and Bengal tigers. According to statistics, since 1990 big cats were involved in the deaths of 16 adults and 5 children; 246 maulings; 254 escapes; and 143 big cats have been killed and 131 confiscated. HR 4122 has been endorsed by animal-loving celebrities like Tippi Hedren. Ironically, Hedren is best known for starring in Alfred Hitchcock’s when-nature-attacks classic movie, The Birds in 1963.